The Jungle Book is a collection of stories written by Rudyard Kipling. It was published by Macmillan & Co. in 1894. The stories tell about life and legends of the Indian jungle. Parts of The Jungle Book have been adapted to television, movies, the theater, and other media. Kipling was born in India, and spent the first six years of his life there. After about ten years in England, he went back to India and worked there for about six-and-half years. 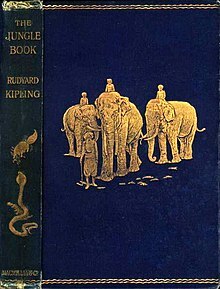 All of the Jungle Book stories were published in magazines in 1893-4. The original publications contained illustrations, some by Rudyard's father, John Lockwood Kipling. These books were written when Kipling lived in Vermont. The tales in the book (and also those in The Second Jungle Book which followed in 1895, and which includes five further stories about Mowgli) are fables, using animals in an anthropomorphic manner to give moral lessons. Kipling put in them nearly everything he knew or "heard or dreamed about the Indian jungle." Other readers have interpreted the work as allegories of the politics and society of the time. The best-known stories are the three about an abandoned 'man cub' Mowgli. They boy is raised by wolves in the Indian jungle. The most famous of the other stories are probably "Rikki-Tikki-Tavi", the story of a heroic mongoose, and "Toomai of the Elephants", the tale of a young elephant-handler. Kotick, The White Seal seeking for his people a haven where they would be safe from hunters, has been considered a metaphor for Zionism, then in its beginning. As with much of Kipling's work, each of the stories is preceded by a piece of verse, and succeeded by another. The title of each is given in italics in the list of stories below. The Jungle Book, because of its moral tone, came to be used as a motivational book by the Cub Scouts, a junior element of the Scouting movement. This use of the book's universe was approved by Kipling after a direct petition of Robert Baden-Powell, founder of the Scouting movement, who had originally asked for the author's permission for the use of the Memory Game from Kim in his scheme to develop the morale and fitness of working-class youths in cities. Akela, the head wolf in The Jungle Book, has become a senior figure in the movement, the name being traditionally adopted by the leader of each Cub Scout pack. The complete book, having passed into the public domain, is on-line at Project Gutenberg's official website and elsewhere. 3. Kaa's Hunting: This story takes place before Mowgli fights Shere Khan. When Mowgli is abducted by monkeys, Baloo and Bagheera set out to rescue him with the aid of Chil the Kite and Kaa the python. Maxims of Baloo. 5. Tiger! Tiger! : Mowgli returns to the human village and is adopted by Messua and her husband who believe him to be their long-lost son Nathoo. But he has trouble adjusting to human life, and Shere Khan still wants to kill him. The story's title is taken from the poem "The Tyger" by William Blake. 7. The White Seal: Kotick, a rare white-furred seal, searches for a new home for his people, where they will not be hunted by humans. 9. Rikki-Tikki-Tavi: Rikki-Tikki the mongoose defends a human family living in India against a pair of cobras. This story has also been published as a short book. 11. Toomai of the Elephants: Toomai, a ten-year old boy who helps to tend working elephants, is told that he will never be a full-fledged elephant-handler until he has seen the elephants dance. This story has also been published as a short book. 13. Her Majesty's Servants (originally titled "Servants of the Queen"): On the night before a military parade a British soldier eavesdrops on a conversation between the camp animals. 14. Parade-Song of the Camp Animals parodies several well-known songs and poems, including Bonnie Dundee. Mowgli - Main character, the young jungle boy. The book's text has often been abridged or adapted for younger readers, and there have also been several comic book adaptations. A comic book series Petit d'homme ("Man Cub") was published in Belgium between 1996 and 2003. Written by Crisse and drawn by Marc N'Guessan and Guy Michel, it resets the stories in a post-apocalyptic world in which Mowgli's friends are humans rather than animals: Baloo is an elderly doctor, Bagheera is a fierce African woman warrior and Kaa is a former army sniper. "Toomai of the Elephants" was filmed as Elephant Boy (1937), starring Sabu Dastagir. In the 1970s there was a television series of the same name, loosely based on the story and movie. Jungle Book (1942 film) - directed by Zoltán Korda, starring Sabu Dastagir as Mowgli. The Jungle Book (1994 film) - starring Jason Scott Lee as Mowgli. The Second Jungle Book: Mowgli and Baloo (1997) - starring Jamie Williams as Mowgli. The Jungle Book: Mowgli's Story (1998) - starring Brandon Baker as Mowgli. The Jungle Book (2016) - directed by Jon Favreau, starring Neel Sethi as Mowgli and Bill Murray as Baloo. Disney's 1967 animated movie version, inspired by the Mowgli stories, was extremely popular, though it took great liberties with the plot, characters and the pronunciation of the characters' names. These characterizations were further used in the 1990 animated series TaleSpin, which featured several anthropomorphic characters loosely based on those from the movie in an comic aviation-industry setting. Chuck Jones' made for-TV cartoons Mowgli's Brothers, Rikki-Tikki-Tavi and The White Seal stick to the original storylines more closely than most adaptations. There was a Japanese anime television series called Jungle Book Shonen Mowgli broadcast in 1989. Its adaptation represents a compromise between the original stories and the Walt Disney version. Many of Kipling's stories are adapted into the series, but many elements are combined and changed to suit more modern sensibilities. For instance, Akela, the wolf pack alpha eventually steps aside, but instead of being threatened with death, he stays on as the new leader's advisor. Also, there is an Indian family in the series which includes Rikki-Tikki-Tavi as a pet mongoose. Finally at the series' conclusion, Mowgli leaves the jungle for human civilization, but still keeps strong ties with his animal friends. The Japanese anime was dubbed in Hindi and telecast as "Jungle Book" by Doordarshan in India during the early 1990s. The Indian version featured original music by Vishal Bharadwaj (with words by noted lyricist Gulzar) and a very good choice of dubbing artistes for the voice acting (Nana Patekar doing the voice over for Sher Khan), which made it quite popular among television series of that time. The anime was also dubbed in Arabic under the title فتى الأدغال (Fatah El Adghal: Boy Of The Jungle) and became a hit with Arab viewers in the 1990s. In 1973, another animated adaptation was released in the Soviet Union called "Mowgli" (Маугли), also known as the 'heroic' version of the story. It's also very close to the book's storyline, and one of the few adaptations which has Bagheera as a female panther. It also features stories from The Second Jungle Book, such as Red Dog and a simplified version of The King's Ankus. "Rikki-Tikki-Tavi" has also been released in 1954 as a cartoon and in 1976 as a feature movie. The former made its way into the hearts of viewers and is even now sometimes aired by TV stations of the Former Soviet Union countries as a classic of Soviet animation. Interestingly, in keeping with Soviet ideology, the Colonial English family in Rikki-Tikki-Tavi has been replaced with an Indian family. Stuart Paterson wrote a stage adaptation in 2004, first produced by the Birmingham Old Rep in 2004 and published in 2007 by Nick Hern Books. A dance adaptation by the Boom Kat Dance Company premiered on May 2, 2008 at Miles Playhouse in Santa Monica, California. It was choreographed by the company with artistic direction by Lili Fuller, Marissa Goodhill, Emily Iscoff-Daigian and Adam North. Pench National Park, near Seoni (Seeonee) is said to be the forest where the Seeonee wolf pack lives. ↑ Hjejle, Benedicte 1983 'Kipling, Britisk Indien og Mowglihistorieine', Feitskrifi til Kristof Glamann, edited by Ole Fddbek and Niels Thomson. Odense, Denmark: Odense Universitetsforlag. pp. 87-114. Wikimedia Commons has media related to The Jungle Book. The Jungle Book Collection: a website demonstrating the variety of merchandise related to the book and movie versions of The Jungle Book. Boom Kat Dance: a website describing the dance adaptation of The Jungle Book by Boom Kat Dance Company. This page was last changed on 13 August 2018, at 02:57.